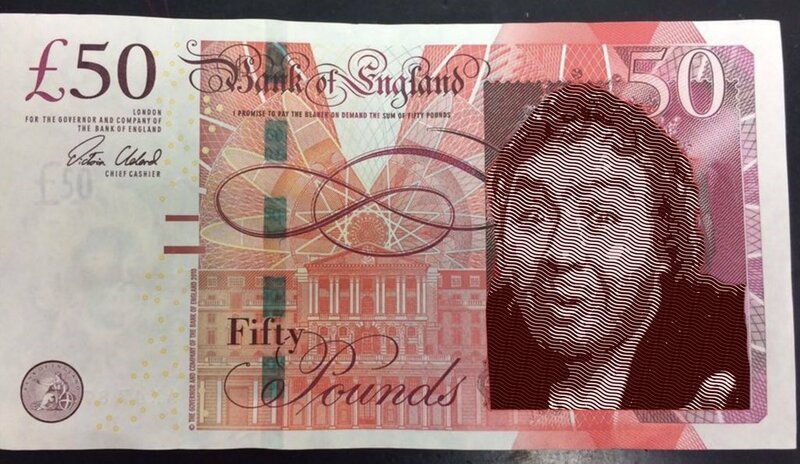 Mike today put up a piece about the two candidates the government is considering sticking on the back of the fifty pound note. They are Alan Turing, the wartime mathematical genius, who broke the enigma code and helped shorten the war. One of the machines Turing designed, or helped design to break the code was programmable, and Turing is respected as one of the founders of modern computing. He was, however, gay at a time when it was very much against the law. He was convicted of gross indecency, and chemically castrated, which led to him taking his own life. Thatcher, on the other hand, is the woman whose policies have inflicted nothing but misery on this planet for nearly forty years. She started the Tories’ and New Labour’s privatization programme, including that of the NHS, the destruction of the welfare state and deliberately made signing on for unemployment benefit as humiliating as possible, in order to deter the poor from doing so. She was also determined to break the unions, manufacturing a strike by the NUM through the gutting of British coalmining, purely to break the union that had brought down Heath’s government years before. And she used the police has her army to attack and beat the miners, aided by a complicit media, including the Beeb. These ran the footage of the strike at Orgreave colliery backwards to make it appear that the miners were attacking the police, while it was the other way round. Exactly as the great peeps on Twitter, whose comments Mike quotes in his piece about it. Ah, but Thatcher was a chemist! She worked for Walls, inventing the process that injects air into ice cream to make it appear that there’s more of it than there is. Dorothy Hodgkin. She’s the woman who should have got the prize for discovering the structure of DNA, as Crick and Watson were looking completely in the wrong direction until they walked past the door of her lab, and heard her talking about her work. She lost the Nobel to them, but did get another prize for another great discovery she made. If she hasn’t been already, it’s the right time to have her commemorated on our folding stuff. Jocelyn Bell Purnell. She was the astronomer, who discovered pulsars. These are tiny, dense stars at the end of their lives, which send out a radio signal. They spin very quickly, so that the signal sweeps across the sky, so that they appear as a regular beat. At first it was believed that they might be signals from an extraterrestrial civilization. Some astronomers also believe that, while they’re natural, space-traveling aliens could use them as lighthouses to navigate their way across the Galaxy. Helen Sharman. She’s another chemist, though at Mars, rather than Walls. But she is know for being the first Brit into space when she joined the British-Russian space mission to Mir in the 1980s. Since then, she’s been something of a science educator, appearing at events to encourage children to take up science. Caroline Herschel. She’s the brother of John Herschel, and daughter of William. She and her brother were astronomers in 18th century Bath, making telescopes and discovering new stars. I’m sure there are many others. These are all astronomy and space related, because that’s the area I’m interested in and know most about. All of these ladies have a better claim to be on the Fifty pound note than Thatcher. But if you want another bloke, how about Dr. Jacob Bronowski. He was another mathematician working during the War. He was also the presenter of the 1970s Beeb science blockbuster, The Ascent of Man. He was also a Fabian socialist with a hatred of war. In The Ascent of Man he makes his view of armed conflict very clear by saying: ‘War is theft by other means’. It’s parody of Clausewitz’s famous phrase ‘War is politics by other means’. Bronowski’s description of war is very true, especially now when we’ve seen that the humanitarian interventions in the Middle East have all been about conquering them in order to despoil their oil reserves, loot their state industries and stop any kind of Arab and Islamic support for Israel. And Iran appears to be next on the hit list. However, I do like the suggestion of Raab C. Brexit that it should be the sage of Govan, Rab C. Nesbitt on the notes. Having his mug staring out at them might just put a few of the really filthy rich off when they get it out to pay for their bottle of Krug. Remember, it was Nesbitt who predicted that there’d be a war between the Toffs and the Scum. The Toffs would win initially, because they’ve got the army. But the Scum would be the victors, because they have all the Rottweilers. One of the big stories last week was the unveiling of the reconstructed face of Cheddar Man. As Jeff Waldorf points out in this clip from TNT Nation, this is a prehistoric man, named after where he was found, and not a man literally made of cheese. Cheddar Man, or rather, his skeleton, was found in the caves in Cheddar in Somerset, England, way back in 1906. The skeleton’s 16,000 or so years old, and so dates from about the end of the last Ice Age. The scientists reconstructing his features also used for the first time DNA analysis to gauge his skin and eye colour. And it turns out that he had ‘dark to black skin’ and blue eyes. They scientists were able to do this using DNA they were able to extract from the skeleton. This had genetic markers similar to those for dark skin, which is also present in ten per cent of the modern British population. Cheddar Man’s colouring was a surprise for the scientists, as they expected him to have white skin and blond or light hair, as an adaptation to the extreme cold. Commenting on the revelation that he was black, one scientist said that it showed that British has not always been associated with Whiteness. It had changed, and would change again in the future. I think they were also able to trace the ultimate origins of Cheddar Man’s people, as they entered Britain from a route across southern Europe ultimately going back to Turkey. I’m not surprised by this revelation. It’s been suggested since at least the 1990s that the first anatomically modern humans – Homo Sapiens Sapiens – who entered and colonised Europe, were dark-skinned. Back in the 1990s a Channel 4 series on human evolution showed a reconstruction of these people, as they would have looked 40,000 or so years ago, edging along the primeval European countryside as Black. The programme also consciously reversed the idea, promoted in many past books and articles on them, that the Neanderthals were Black. The programme instead argued that they would have had light skins as an adaptation to the arctic temperatures in Europe. If you also look at the remains of our ancient ancestors, you also find that they have more archaic features, like a strong brow ridge, than the other humans in Africa, who were much more gracile. I think its these archaic features which led some archaeoanthropologists to state that some of these humans were of the same physical build as Aboriginal Australians, because these ancient people have also retained some features of archaic humanity. The real shock, as one of the articles about Cheddar Man said last week, is how recently White skin and hair evolved – in the last 10,000 years or so. It’s much more recent than they expected. However, I can remember reading in a review of the film The Clan of the Cave Bear in Starburst one of the criticisms of that movie. It starred Daryl Hannah as a Cro Magnon woman growing up with a family of Neanderthals. Hannah’s blond, and the article pointed out that blonde hair is only supposed to have evolved 10,000 or so years ago – much later than the age the film, and the book on which it was based, by Jean Auel, is set. The revelation that Cheddar Man was Black, however, set the racists off. And here Waldorf reads out and tears to pieces some of the comments about this story left on the Daily Mail’s website. And they go from the reasonable, to the completely mad. Waldorf begins with the comment from one individual, who wonders if the genetic reconstruction is accurate, given the age of the skeleton and difficulty of extracting genetic information from remains that ancient. He states, however, that he isn’t a scientist, but has simply watched a lot of documentaries. Waldorf mocks him for this, which is actually unfair. It’s a reasonable question, as the impression I’ve had from watching the same kind of documentaries is that ancient DNA can be extremely delicate, and is very often fragmentary, so it can actually be very difficult to extract useful genetic information from human remains. I can remember reading an article a few years ago, which made this point when discussing the Neanderthals to show why scientists have not tried to recreate them genetically. And then there’s the completely bonkers. Another commenter wondered if there wasn’t something deeper going on here. They smelt a conspiracy, as the revelation that Cheddar Man was Black came after, so this person believed, the collapse of the ‘out of Africa’ theory of human origins, and the proof that the Ancient Egyptians weren’t African. First of all, if the theory that humans first evolved in Africa and then spread outwards across the globe has collapsed, then no-one’s told me. Or any of the anthropologists and archaeologists working in this field. The only people I can think of who reject the theory are, er, marginal thinkers. Or cranks. Waldorf takes apart the claim that the ancient Egyptians weren’t Africans, by pointing out that ancient Egypt actually had a very diverse population, and that in the south they tended to be darker than in the north. Also, Egypt is part of Africa. This comment seems to echo back to the views of some of the White racial supremacists that the ancient Egyptians, as the citizens of an advanced ancient civilisation, couldn’t possibly be Black, and were instead White and European in appearance. This is, of course, vehemently rejected by AFrocentrist historians, who argue instead that they were Black. If you look at the way the ancient Egyptians depicted themselves in their art – in the tomb paintings, for example, they are lighter than the darker skinned Nubian peoples to their south. Male ancient Egyptians are portrayed as having reddish brown skin, while women are yellow. Nubians are painted with black skin. Even so, they are still darker than the Europeans, which appear in their art, such as the people of Minoan Crete. These are depicted with pink skin. The scientifically accepted view is that the peoples of North Africa, including ancient Egypt, were White. However, way back in the 1990s or the early part of this century some anthropologists reconstructed the faces of people from Roman Egypt. This found that their features were more strongly African than the portraits of them painted on to their mummy cases, which made them look more European. There were definite cultural and economic reasons why an ancient Egyptian really wouldn’t want to be seen as ‘Black’. Roman Egypt was a horrible, racist, apartheid state, where the indigenous Egyptian population was taxed more than those of Greek or European descent. This would have left many Egyptians with feelings of inferiority about their African features, which they would have tried to cover up. There was also the suggestion by one archaeologist that the ultimate origins of the ancient Egyptian civilisation lay in a Black tribe from further south, which migrated to the north. This archaeologist came to this conclusion through examining some of the early henge monuments, which predate the ancient Egyptian civilisation proper by thousands of years. I think these were similar to those in the Black African nations further south. One of the stones in these monuments also seemed deliberately shaped to resemble a cow. Hathor was the ancient Egyptians’ cow goddess, and so there’s the suggestion that she was a survival from this ancient, pastoralist Black African culture. I also came across another story in the paper recently, which said that the ancient Egyptians weren’t African after all. I didn’t get the opportunity to read it – I only glimpsed the headline in passing – and so can’t really comment on it. But it seems unlikely to me. The Egyptologist John Romer criticised the notion that the ancient Egyptians were White way back in the 1990s in his Channel 4 series, Great Excavations. In one episode, he discussed the various diffusionist theories of human evolution and progress, and how they were influenced by 19th century theories of racial supremacy and conquest. Diffusionism is the archaeological theory that advances in civilisation occur through successive societies and races conquering their predecessors. Early archaeologists were busy examining the remains of these past cultures, and especially their skull and head shapes, in order to develop a classification of the various races these different physical types represented. As the ancient Egyptians were an advanced civilisation, they confidently expected them to have their origins in the lighter skinned peoples further east. Except that they didn’t. The ancient Egyptian people remained the same stock, unchanged, as their culture developed and flourished around them. They created their culture themselves, without any other invading race creating or imposing a superior culture after them. Of course, at times ancient Egypt was conquered by outside nations, such as the Semitic Hyksos kings and the Nubians, who produced a line of Black pharaohs. They were also an important power themselves in the ancient Near East, at one point holding Syria and Palestine. But ancient Egyptian culture was their own creation, and not the result of invasion by some biologically superior race. And as far as I know, the only people, who believe that the ancient Egyptians had blonde hair and blue eyes are neo-Nazis. Now I think there is a subtle message behind this recent discovery of Cheddar Man’s complexion. I think some of the comments made by the experts about his colouring and Britishness – that it is only relatively recently that White skin has evolved, and that Britishness is not necessarily connected to Whiteness – have been made to make an anti-racist point. It wasn’t just the scientist quoted by the TNT clip. There was another quote in the papers by someone saying that we may have to rethink the relationship between Britishness and Whiteness. It’s a reasonable, scientifically informed comment. But the recreation of Cheddar Man with dark skin clearly touched a nerve amongst the racists reading the Daily Heil. As for Cheddar Man himself, he still has descendants in the area. Or at least, a descendant. A few years ago scientists sampled his DNA, and then tested the other people in Cheddar to see if they were related. It turns out one of them was – the headmaster of the local school. He was quite happy about it, but his mother was really upset, worrying what people would think. Well, if they’re sensible, they won’t think anything disparaging. As I said, these people were exactly like us modern humans. They had the same physical features and the same intelligence. They weren’t lumbering ape-men by any means. The only difference between modern people and them is that they lived over 10,000 years ago, when much of Britain was a frozen wilderness. I can even imagine some people being slightly envious, that this chap has an ancestry that can be traced back to this incredibly remote period. Interestingly, the brief interview with Cairns-Smith suggests that the distinction drawn by some opponents of Intelligent Design between the origin of life and Darwinism is not accepted by all scientists. While Darwin himself did not discuss the origin of life, but merely speculated in a letter to a friend in 1871 that it may have occurred ‘in some warm little pond, with all sorts of ammonia and phosphoric salts, light, heat, electricity present’, Cairns-Smith himself stated that the process involved Natural Selection. 11 In answer to the question ‘What is your advice to anyone thinking of entering this area of research?’, Cairns-Smith answered ‘Oh, to forget about the chemistry of life as it is now and look creatively for the simplest real chemical systems that can evolve through natural selection, whatever they are made of.’ 12 It thus appears from Cairns-Smiths comments that however different the process of the origin of life may be from the evolution of living organisms, it is still held to be the product of Natural Selection. Thus, while the article certainly wasn’t as pessimistic about the possibility of discovering a materialist solution to the origin of life, it was clear that all the scientific theories presented had major flaws. The mention of Creationism alongside the materialist scientific theories is interesting. It’s clear that the article wasn’t written from a Creationist standpoint, and broadly supported the search for a materialist solution to the problem of the origin of life. Nevertheless, it seems extremely unlikely to me that many science magazines would ever have even mentioned Creationism as a solution at the time, even if merely for the sake of completeness, because of the threat that it is held to present to materialist science, which is construed and presented as genuine science in opposition to non-materialist approaches. It might have been because Creationism has, until very recently, been very much a minority point of view in Britain, though one that has been vigorously attacked over the past decades by Richard Dawkins, amongst others. With the growth of interest in Intelligent Design since the 1980s, I do wonder if Creationism would now be mentioned without an explicit condemnation, even in passing, in a British popular science magazine. 1. Robert Matthews, ‘History of Pondering Life’s Origins’, Focus, no. 130, September 2003, p. 39. 2. Matthews, ‘A Landmark Experiment’, Focus, no. 130, September 2003, pp. 38-41. 3. Matthews, ‘A Landmark Experiment’, Focus, no. 130, September 2003, p. 41. 4. Matthews, ‘A Landmark Experiment’, Focus, no. 130, September 2003, p. 40. 5. Matthews, ‘A Landmark Experiment’, Focus, no. 130, September 2003, pp. 40-41. 6. Matthews, ‘A Landmark Experiment’, Focus, no. 130, September 2003, p. 41. 7. Matthews, ‘Has Life Originated More than Once on Earth?’, Focus, no. 130, September 2003, p. 41. 8. Matthews, ‘How Did Life Get Started – Seven of the Most Popular Theories Currently being Debated’, Focus, no. 130, September 2003, p. 42. 9. Matthews, ‘How Did Life Get Started – Seven of the Most Popular Theories Currently being Debated’, Focus, no. 130, September 2003, p. 42. 10. Matthews, ‘How Did Life Get Started – Seven of the Most Popular Theories Currently being Debated’, Focus, no. 130, September 2003, p. 42. 11. Matthews, ‘Meet the Origin of Life Expert’, Focus, no. 130, September 2003, p. 41. 12. Matthews, ‘Meet the Origin of Life Expert’, Focus, no. 130, September 2003, p. 41. 13. Matthews, ‘How Did Life Get Started – Seven of the Most Popular Theories Currently being Debated’, Focus, no. 130, September 2003, p. 42. 14. Matthews, ‘How Did Life Get Started – Seven of the Most Popular Theories Currently being Debated’, Focus, no. 130, September 2003, p. 43. 15. Matthews, ‘How Did Life Get Started – Seven of the Most Popular Theories Currently being Debated’, Focus, no. 130, September 2003, p. 43. 16. Matthews, ‘How Did Life Get Started – Seven of the Most Popular Theories Currently being Debated’, Focus, no. 130, September 2003, p. 43.